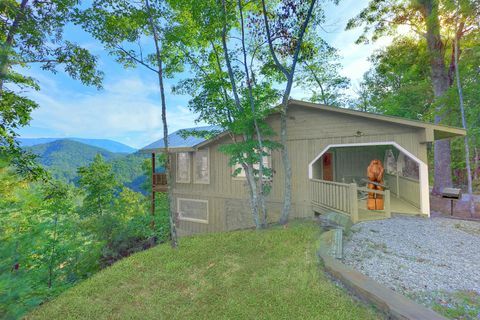 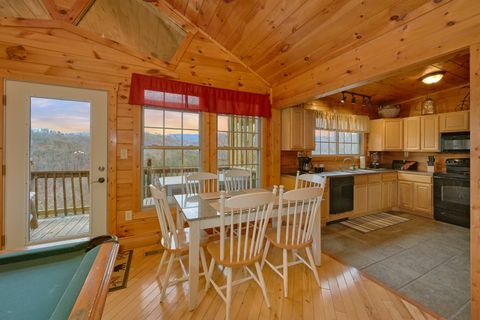 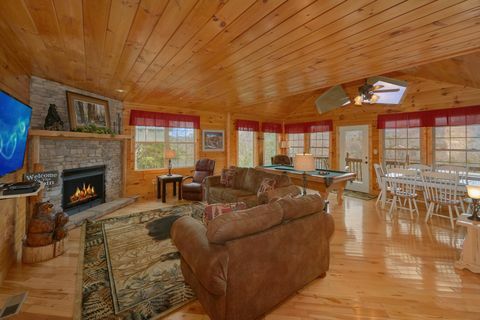 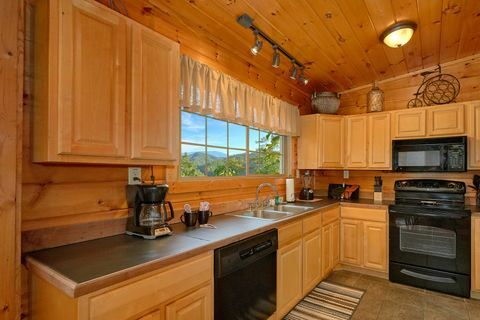 Come enjoy a Smoky Mountains cabin with mountain views at "Bear Hugs!" 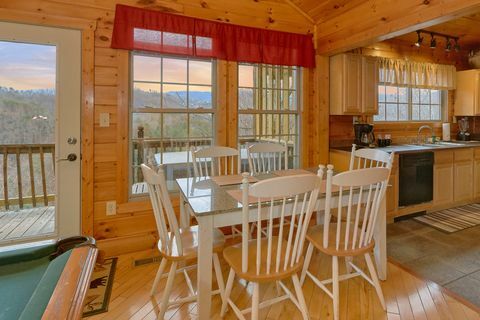 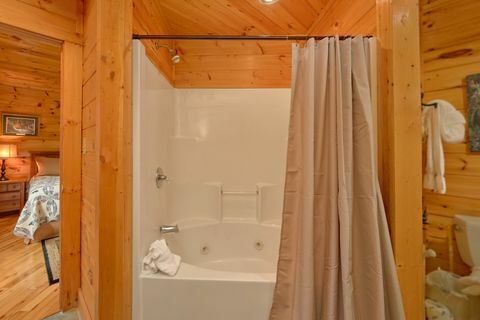 This adorable one-bedroom Wears Valley cabin rental gives vacationers the perfect escape to the scenic Tennessee Smoky Mountains complete with a splendidly comfortable interior, breathtaking views, and a convenient location on the sleepy side of the Smokies. 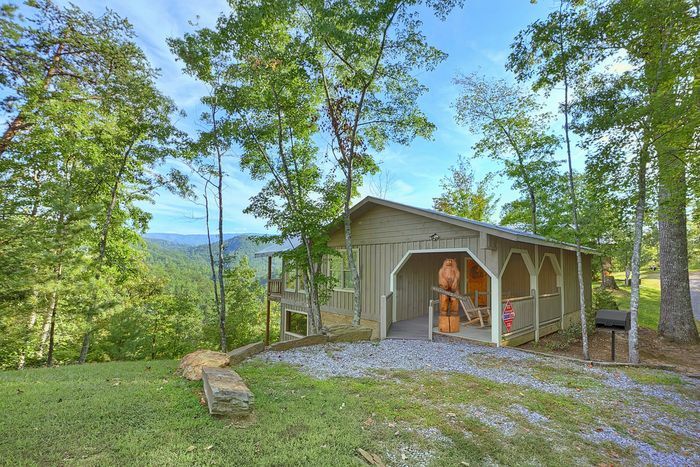 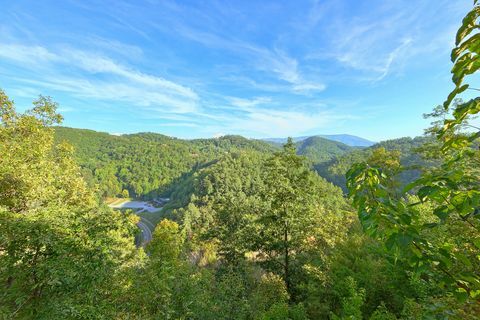 If you've been searching for a romantic honeymoon cabin with breathtaking mountain views that still keeps you minutes from Downtown Pigeon Forge, this private Wears Valley cabin may be the perfect choice for you and your someone special. 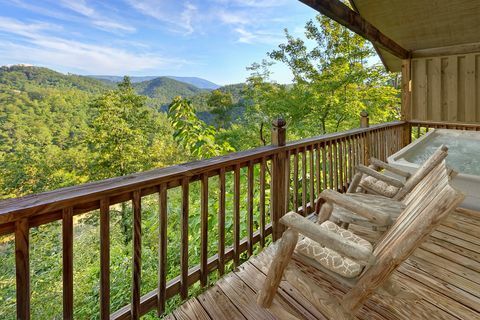 Resting in a wooded mountaintop setting, guests of this Wears Valley cabin rental can enjoy 280 degrees of scenic Smoky Mountain views from the cabin's porch or relaxing the log porch swing in the expansive level yard. 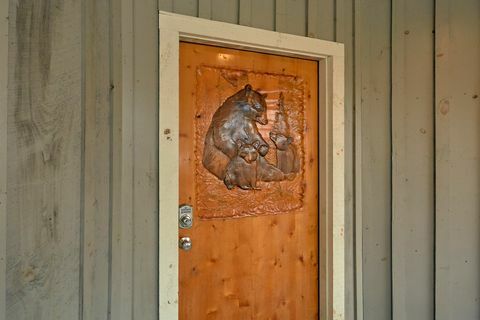 After entering through this cabin's adorable custom-carved bear-themed front door, vacationers find every amenity they'll need for a relaxing cabin stay. 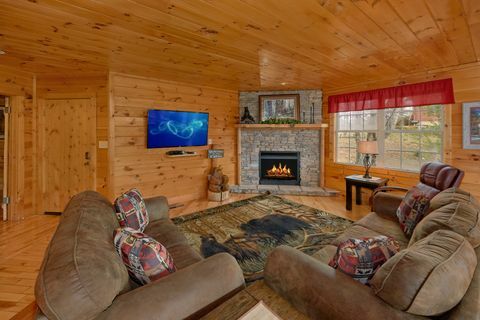 The large, open living area houses a comfortable sofa in front of an electric fireplace. 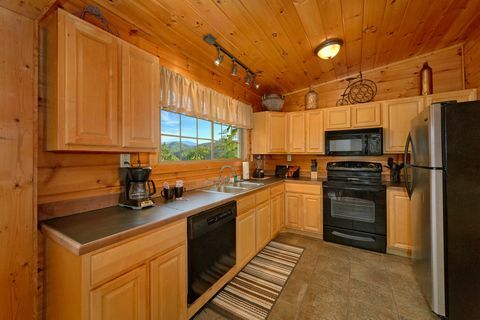 Nearby, the kitchen with plenty of counter space allows guests to cook delicious meals to enjoy in the dining area while looking out at the rolling green hills. 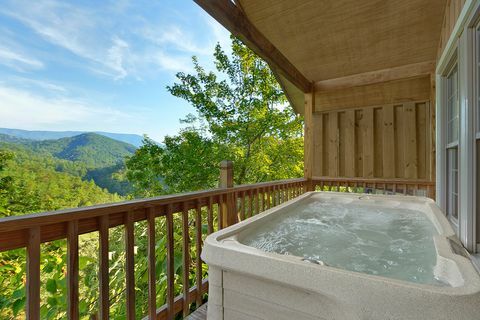 Outside, enjoy the splendor of the surrounding Smokies while relaxing in the hot tub on the covered deck and soaking in the spectacular mountain views. 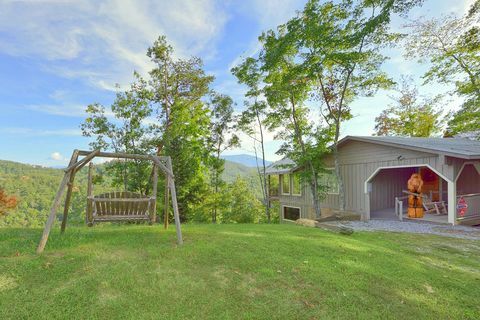 Make sure to set aside a day to host a cookout in the mountain air on the charcoal grill. 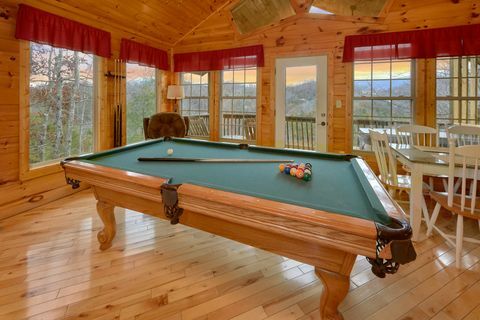 There are plenty of things to do around your cabin as well. 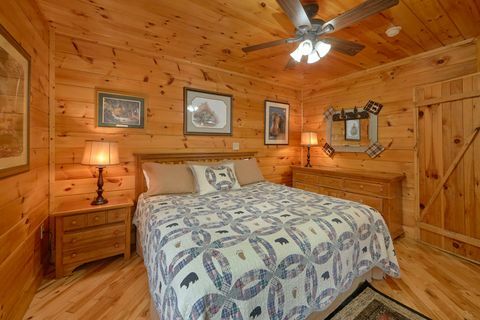 Mom-and-pop stores and antique stores offer unique shopping opportunities on the quieter side of the Smokies. 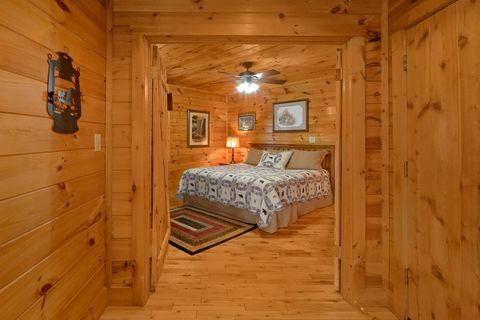 Additionally, this Wears Valley cabin rental lies just a short drive from the Smoky Mountains' biggest attractions, family restaurants, and live stage entertainment. 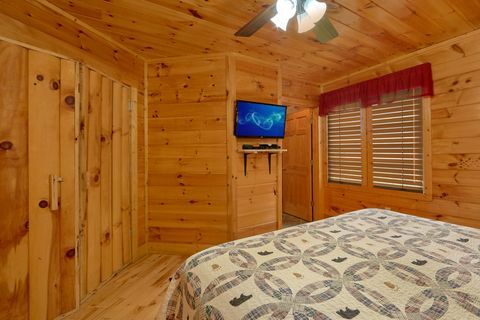 At the end of the day you can relax in your king bedroom that comes complete with a TV for your own personal mountain oasis. Need more space for a family reunion or church retreat? 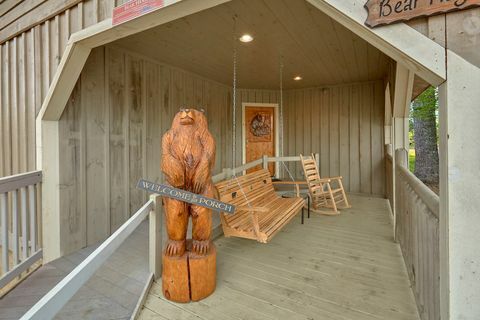 "Bear Hugs" is within walking distance of three other cabins - "Hilltopper," "Higher Ground," and "TipTop," creating a cabin group ideal for larger groups. 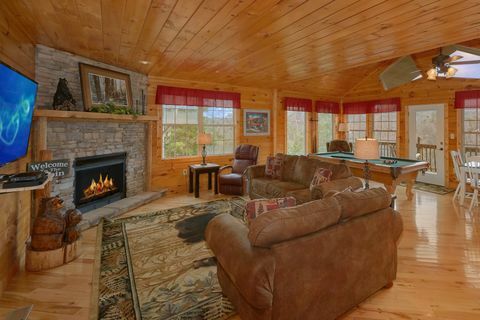 Four-wheel drive is strongly recommended for this cabin rental in the winter months!! 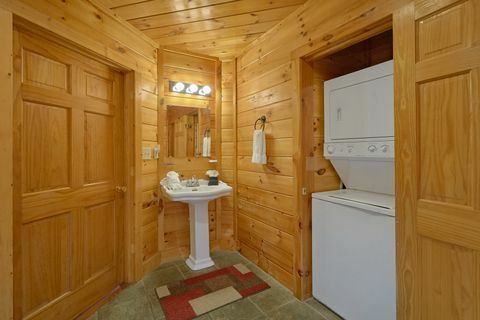 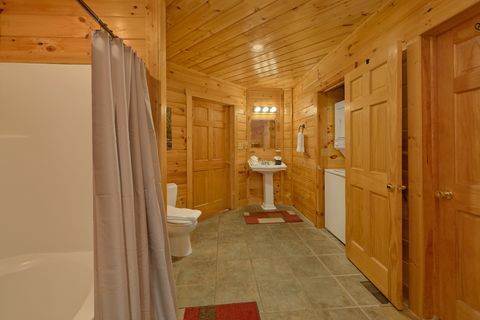 For more information on any of Cabins USA's Wears Valley cabin rentals, please visit our website for more information on pricing and availability as well as an immediate 15% on all online cabin bookings.